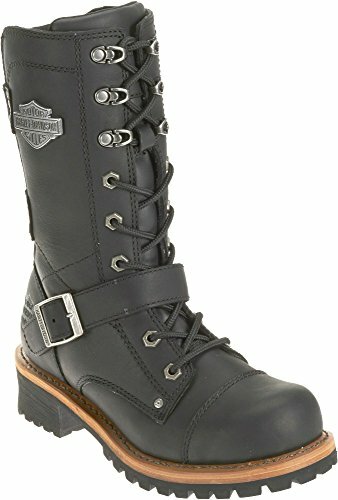 Harley-Davidson® Women's Riding Appropriate* Performance Albara black leather motorcycle boots. With a mid-calf shaft, these boots bring together form and function. Made with the best full grain leather uppers available, and industry's best YKK® locking zippers for ease of putting on and taking off. Designed with riveted D-Ring eyelets at the top, a front cross strap with Harley® buckle, a Harley® Bar & Shield badge on shaft, two riveted back support straps, and an embossed Harley® Bar & Shield on the heel. Total height: 10.5-inches, Shaft height: 9-inches, Heel height: 1.5-inches. Rubber outsoles make for easy standing, riding, and a flexible easy stride. The boot's sole, insole and upper are bound using resoleable Goodyear® Welt construction processes, the most labor intensive and durable construction method available. Manufacturer Part Number D87066.